ECOCYCLE Americana contains between 5 and 20 percent pre-consumer recycled content and is manufactured using processes certified by Scientific Certification Systems (SCS). 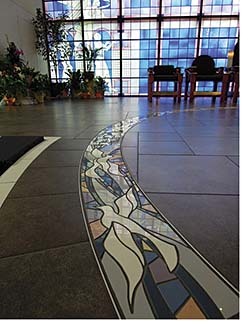 Tile is recommended for use for interior floors, countertops, walls, and exterior walls. Available in 12-inch-by-12-inch and 18-inch-by-18-inch tiles. Colors go all the way through the tile. Features Crossville's Cross-Sheen finish for ease of stain and scuff mark removal. No waxes or sealers are needed for cleaning.